The Low Down: Nikki Beckett wakes up after a long sleep. She doesn’t want to get up – she wants to stay there, wrapped up with Cole. But it’s time. Reluctantly, she rises. Something else, though, is spurring her reawakening…a face keeps invading her thoughts…but she can’t even remember his name. She only knows that she has to see him. Nikki and Jack had been friends forever, friends first. He called her “Becks.” She had eventually developed a mad crush on him, but it was the intervention of her best friend, Jules, that finally got them together. But then Cole came into her life. The guitarist for the Dead Elvises, he seemed to take a liking to Nikki. And when she was around him, she felt…uneasy about Jack, about Jack’s ex, Lacey, about everything. Cole made her feel better. Then she felt nothing at all. Now Nikki’s back in Park City after being gone for six months in above-ground time, a hundred years in Everneath time. No one knew where she went, but everyone thinks that the verdict from her mom’s hit-and-run death pushed her away and towards drugs. But Nikki has to see Jack just once more and say a proper goodbye to her father and younger brother before she leaves for Everneath…forever. But Jack isn’t going to make the choice that simple, Cole won’t take no for an answer, and Nikki doesn’t think she believes in heroes anymore. Here’s the Thang: I love stories that are based on Greek myths, like Meg Cabot’s Abandon series or Percy Jackson. The story and the legacy of Persephone is wound tightly throughout this tale. We learn that there is an element of truth in all myths, But just how much? Alternating between before her disappearance and after her return, the story takes on a depth without being over-the-top or maudlin. This easily could have been a woe is me kind of book, where the heroine’s reactions were impulsive and juvenile. While there were those moments where doing something differently could have reversed everything, the responses by the characters were very real and honest. It’s the difference between the girl in the horror movie who goes (in her high heels) to check out a noise in the basement and the girl whose normal, slight doubts were exacerbated by something beyond her control. The Bottom Line: You won’t need six pomegranate seeds or the Shop-n-Go to get there. Just get there. 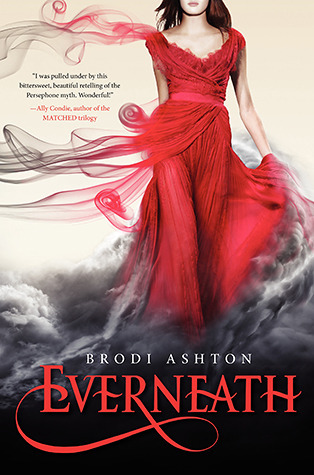 Everneath by Brodi Ashton was published January 24, 2012 by Balzer + Bray. Ink and Page picked this book up from the library, so no one had a choice about whether it was reviewed. You Might Want to Know: OK, I wasn’t looking that hard, but I only saw maybe 1 word that some may call profanity. But that’s it. I have been meaning to read Everneath forever! Everyone keeps telling me how wonderful it is, but I haven’t gotten to it. Now I feel like I need to read it even more. I also love Greek myths stories – Percy Jackson is AWESOME!